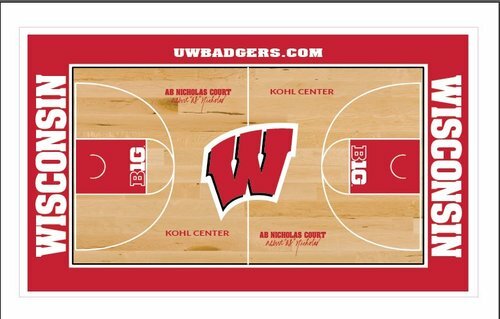 #Badgers officials about to raise a banner with "Nicholas 8" to the KC ceiling. UW's offensive rebounding percentage in the first half: 51.9. "When I think of Ab, I think of a true Badger." "Ab's been a great leader, a great mentor. I think he'll live on through the other people he's helped." Vitto Brown comes out of the locker room and splashes a pair of 3-pointers. 51-27 Wisconsin. It may not look like it tonight, but the Badgers do work on free throws at practice. #Badgers Brown: 10 points, 5 bds and 2 assists in 18 minutes. Bronson Koenig has five 3-pointers -- the school record is seven -- and the #Badgers lead 59-33 with 15:28 left in the game. OSU got killed on boards in first half. Second half: Buckeyes' D is porous. #Badgers have 59-33 lead with 15:28 left. Looks like @BronsonK_24 is wearing his 3-goggles tonight. ???????? Make it FIVE triples for BK! Wisconsin has hit 3-pointers on four of its first seven possessions to build a 59-33 lead over Ohio State with 15:28 remaining. #Badgers are now 10-16 from 3-point range. Koenig leads the way 5-6. Bronson Koenig is going ???? The #Badgers are on ???? Life's GOOD at the Kohl. Wisconsin now 3-for-12 on free throw attempts. If Thad Matta had a deeper bench, OSU could get back in the game just by fouling. #Badgers ' lead is up to 28. Now Nigel Hayes is out here dunking on Buckeyes! ???? This is getting good. Wisconsin up 30. OSU dominating one stat: 9-10 on FTs compared to 3-12 for #Badgers . Wisconsin was 2-for-14 from 3-point range against Purdue. Badgers are 12-for-18 from 3-point range with 11:54 to go. Go figure. Alex Illikainen with two triples! The #Badgers are now 12-for-18 from downtown. The #Badgers are now 12 of 18 from 3-point range, 6 of 6 this half, and lead 69-41 with 11:54 left. Illikainen has 2, his first since 11/15. Remember Thad's stellar OSU teams, the ones that reached the Final Four? Buckeyes light years from that level now. The #Badgers are shooting 50% and rebounding 70% of their misses. Justin Wilcox was set to make $950 ,000 next season. Should be plenty of good candidates for Wisconsin to choose from at that salary. KHALIL IVERSON DOING KHALIL IVERSON THINGS! Wisconsin shooting 49.2% FG, 57.1% 3FG. Bronson Koenig leading the way with 21pts. Nigel Hayes has 15pts. We shall see if this is a one-game flash or more but the confidence of #Badgers Illikainen has to be boosted 2nite. Looking for something to fill the #SCTop10 tonight? Khalil Iverson is here for you. ??? ?